It’s one of the most loved stories of all time, spawning hundreds of knock-offs and fuelling romantic dreams of women everywhere. Whether you love it or find it snooze-inducing, Jane Austen’s host of comedic characters just might hold some insight into the writing life–insight from which we can all stand to learn. Have you stopped to consider what each of the following characters might tell you about writing? 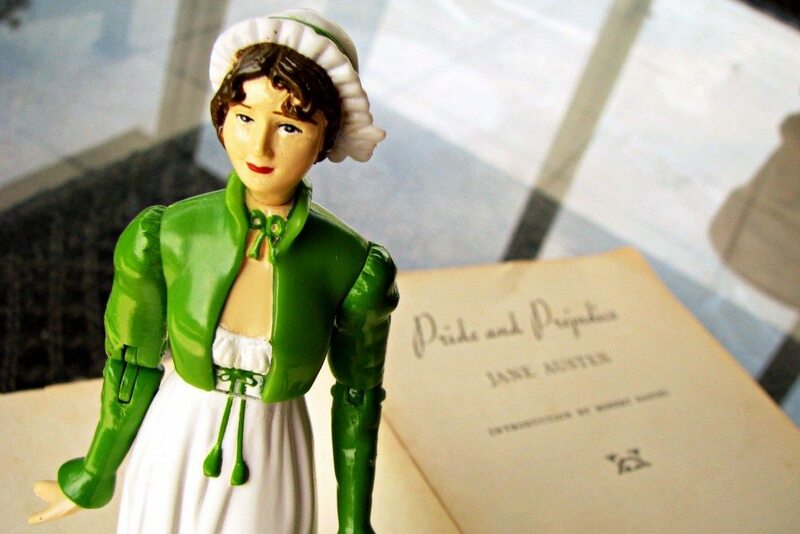 Elizabeth Bennet: Be true to yourself. Elizabeth, for lack of love, is faced with with the choice of marrying for money or becoming a poor spinster. Although she is made offers of marriage by both Mr. Collins and Mr. Darcy–and acceptance of either would mean financial security–Elizabeth remains true to herself, refusing to marry for anything but love. Likewise, writers must be true to themselves and their goals. Once you know what you want out of your writing, go for it. If you’re holding out for a traditional publishing deal, don’t be convinced to self-publish. If you’re happy self-publishing, don’t let someone tell you it’s second-rate. You wouldn’t want to write anything that compromised your beliefs and morals simply to make a sale. Of course, you’re at liberty to amend your goals at any time. In the end, Elizabeth ultimately decides Mr. Darcy is the source of both love and financial security, doesn’t she? Mr. Darcy: Be proud of your accomplishments, but not vain. Mr. Darcy makes it known he believes vanity is weakness, but pride is acceptable. If you’ve managed to write a book, you should feel proud of yourself. It’s an enormous task, and few people have the tenacity to finish what they start. However, don’t get too full of yourself just yet–vanity over one’s accomplishments is not a desirable personal quality. Editors or agents won’t be keen to work with those who think they’re the next best thing, or who are resistant to critical feedback. Be happy about what you’ve done, but always looking for ways to improve your writing. Lydia Bennet: Know when to take risks and when to play it safe. Although she takes some foolish risks in running away with the deplorable Mr. Wickham, Lydia Bennet’s character is the very essence of spontaneity. When’s the last time you were spontaneous with your writing? Have you tried something new recently? Are you seeking to push the boundaries of what you know? Lydia Bennet’s main fault was that she took too many risks, often to the detriment of herself and others. Good writers know when it’s acceptable (and even necessary) to take risks, and when it’s best to play it safe. Charlotte declares that she’s never been one for romance. What she wants is practicality. Security. It’s for this reason she is quick to accept Mr. Collins’ offer of marriage. He may not be a hunk, but his cozy parsonage and frequent dinner invitations to Rosings Park start to look pretty good to the unmarried spinster. Writers need to be practical in their pursuit of publication. Don’t give up your day job because you think you see the light at the end of the tunnel. Be aware of the competition you’ll face. Understand that publishing is a business and you need to remain business-like. Don’t get caught up in unproductive dreams. Set goals and learn how to achieve them. Mr. Collins: Don’t let your own stupidity stop you. Mr. Collins is undoubtedly one of the most foolish characters in all of literature. He is socially obtuse, which allows him to boldly propose to Elizabeth, in spite of her attempts to discourage him. Take a hint from Mr. Collins and don’t let your own stupidity stop you from writing. By stupidity, I mean allowing yourself to give up, to procrastinate, to discourage yourself. There will be times when you feel you’re incapable of writing anything remotely close to being publishable. The good news is you can fix that. Educate yourself, learn from the masters, practice every day, read everything you can get your hands on. Who are your favourite literary characters, and what advice would they give you on writing? How about some of these unique figures? Excellent post thank you very much! I especially liked Mr Collins' contribution. RE the other figures at the end, as the mother of a fairly demanding toddler, I would have to give a nod to Count Olaf and say don't let children get in the way of what you want (cue evil laugh). Count Olaf is classic. That's probably exactly what he would say about writing! Thanks. Such a smart post, Suzannah. Love it! In guiding my writing, I tend to follow M. Hercule Poirot's advice: always use your little gray cells. Thanks Diar, that's great advice!